The race has been volatile and this debate was no different. 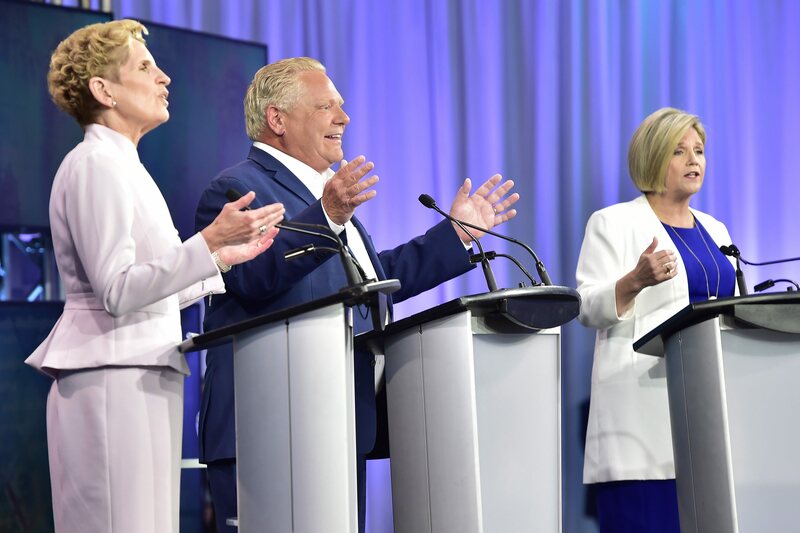 Ontario NDP Leader Andrea Horwath speaks as Ontario Liberal Leader Kathleen Wynne, and Ontario Progressive Conservative Leader Doug Ford look on during the final televised debate of the provincial election campaign in Toronto on Sunday. TORONTO — Doug Ford came under repeated attack from both the NDP and Liberal leaders during Sunday's provincial election debate for not yet presenting a full platform, when Ontarians are already casting their ballots in advanced polls. Recent polls have suggested the NDP has surpassed Ford's Progressive Conservatives in popular support, which also made party leader Andrea Horwath a target in the third and final televised debate of the campaign. But she shot back at Ford after he slammed the NDP over an error in the party's platform that means it would cost $1.4 billion more per year than expected. "We did admit that there was a mistake and we fixed it right away," she said. "We haven't even seen any numbers from Mr. Ford. People started voting yesterday, Mr. Ford — where is your platform? Where is your respect for the people now, when they're already at the polls and you haven't provided them any information about what it is you plan to do in our province? What are you going to cut?" Ontario Liberal Leader Kathleen Wynne, left to right, Ontario Progressive Conservative Leader Doug Ford and Ontario NDP Leader Andrea Horwath listen to a question from an audience member as they participate during the third and final televised debate of the provincial election campaign in Toronto on Sunday. Liberal Leader Kathleen Wynne — whose approval ratings plummeted below 20 per cent as premier, and whose party is a distant third in the polls — slammed Ford as well for not having a plan. As Ford criticized the state of the province's health-care system under the Liberal government, he said he would consult with front-line health-care workers to fix the problems. "We're going to make sure that we listen to the front-line doctors and the nurses," he said. "You know what Doug, you could have had those conversations then you could have had a platform ready," Wynne said. "The fact is, that's actually how you write policy. That's how you develop a platform and policy, you talk to the people in the field." Questions about funding Ford's pledges have largely been met with vague promises of finding "efficiencies." The Liberals and NDP say that just means cuts to public services, but Ford has said his efficiencies wouldn't result in a single job loss. 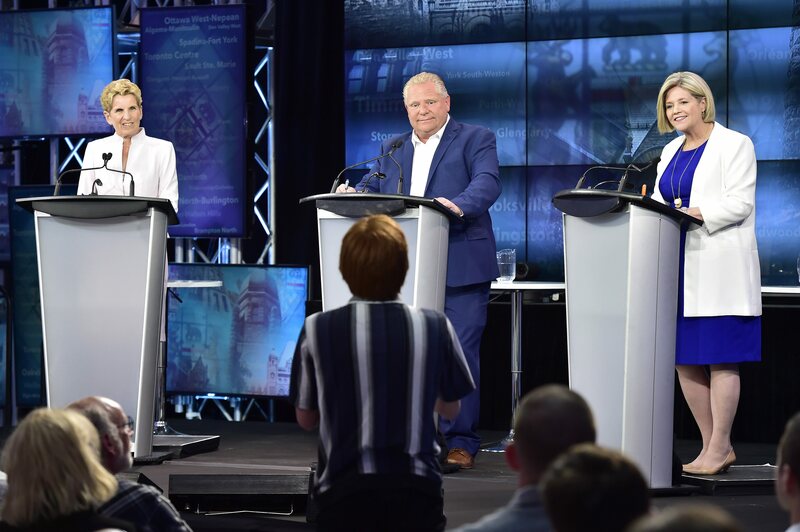 Ford and Horwath's attacks during the debate focused almost exclusively on each other, as polls suggest the two are leading the race to become the next premier. 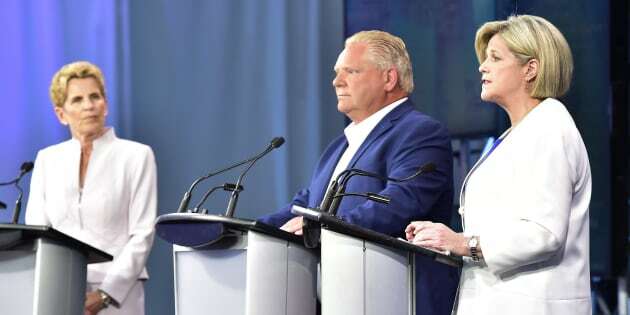 Ontario Liberal Leader Kathleen Wynne, left to right, Ontario Progressive Conservative Leader Doug Ford and Ontario NDP Leader Andrea Horwath participate during the third and final televised debate of the provincial election campaign in Toronto on Sunday. "Here's what I want to say about the last five years: sorry not sorry," she said. "I'm really, genuinely sorry that more people don't like me. But I am not sorry about all of the things that we're doing in Ontario to make life better." Wynne used her question in a leader-to-leader section of the debate to challenge Horwath, who said she couldn't imagine a scenario in which she would use back-to-work legislation — as the Liberal government did to end a five-week strike by college faculty last year. "I know that you are beholden to the unions on this," Wynne told Horwath. "Oh Kathleen, wow. That's really sad," Horwath replied. 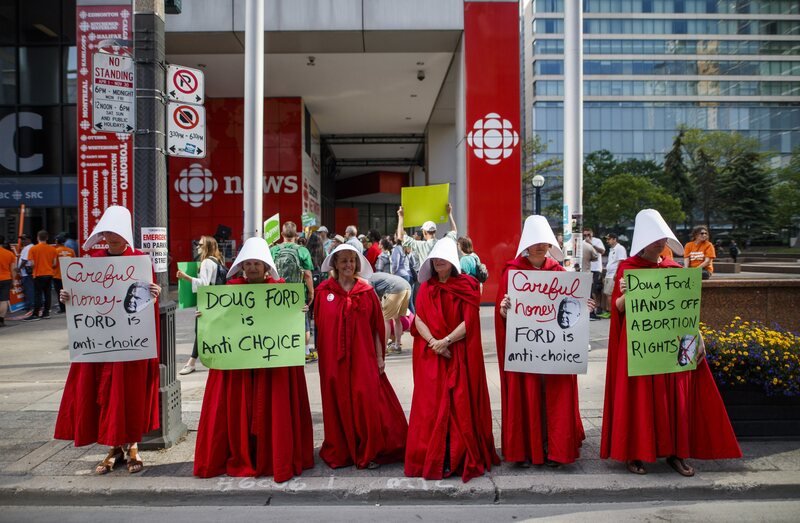 Abortion rights activists dressed up as characters from "The Handmaid's Tale" hold signs ahead of the Ontario Elections Leaders debate at the CBC building in Toronto on Sunday. Wynne argued there needs to be a tool to end labour disputes, while Horwath said such legislation isn't a tool, it is a removal of constitutional rights. When the NDP leader said her leader-to-leader question was for Ford, he said he "wouldn't expect anything different" and she replied, "Well, that's good, you're catching on." "Show us the plan, Mr. Ford," Horwath said, repeating her call for him to release a fully costed platform with less than two weeks to election day. "You wouldn't buy a used car without looking under the hood. Why should anybody buy your plan without seeing it?" 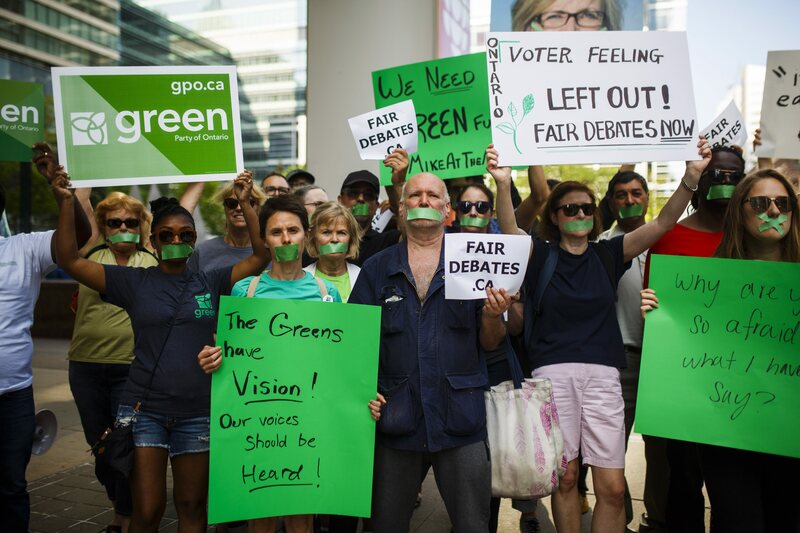 Ontario Green party supporters hold signs ahead of the Ontario Elections Leaders debate at the CBC building in Toronto on Sunday. The Greens were not represented in the debate. "The NDP will annihilate, my friends, the middle class," he said. "We've seen it before." Ford's lack of a costed platform could be something that hurts his credibility with voters, said Western University associate political science professor Cristine de Clercy. "I think they generally made him look pretty foolish tonight over his lack of a platform," she said. "He unconsciously contributed to this perception ... by consistently attacking the other parties' programs and then they would immediately rebut and say, 'Well what about yours?' He doesn't have a good answer for that." 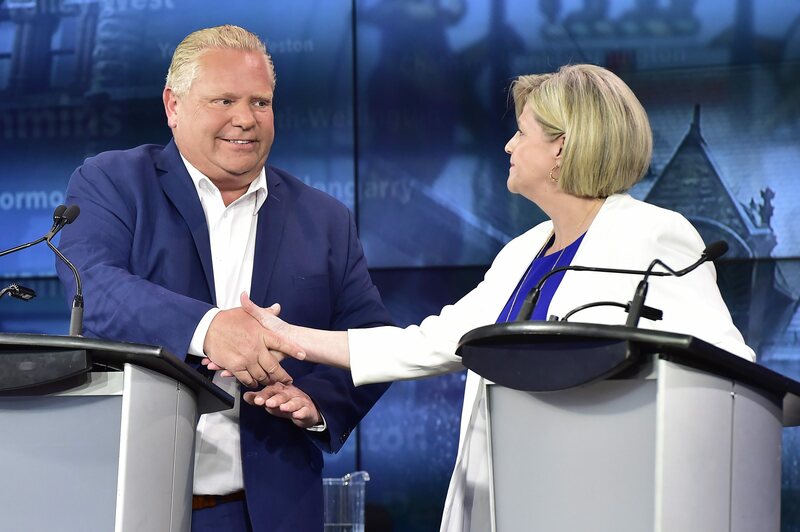 Candidates Doug Ford and Andrea Horwath shake hands after the debate. "I thought, she's ready for prime time," she said. "This is someone who is working at communicating she can govern. I've been watching her for a while and I've never had that impression before." "He used the word 'terrifying' several times," she said. "It was clear to me that he sees the challenge in Ms. Horwath and he really pulled out all the stops, he did every thing he really could to signal to voters why the New Democratic Party is not a good choice." Wynne's "sorry, not sorry" defence was a novel good way to address her unpopularity, but may not matter in the end to voters, she said.